Preident Ibrahim Mohamed Solih has assured that the Maldives would always support Palestine's efforts towards their independence. 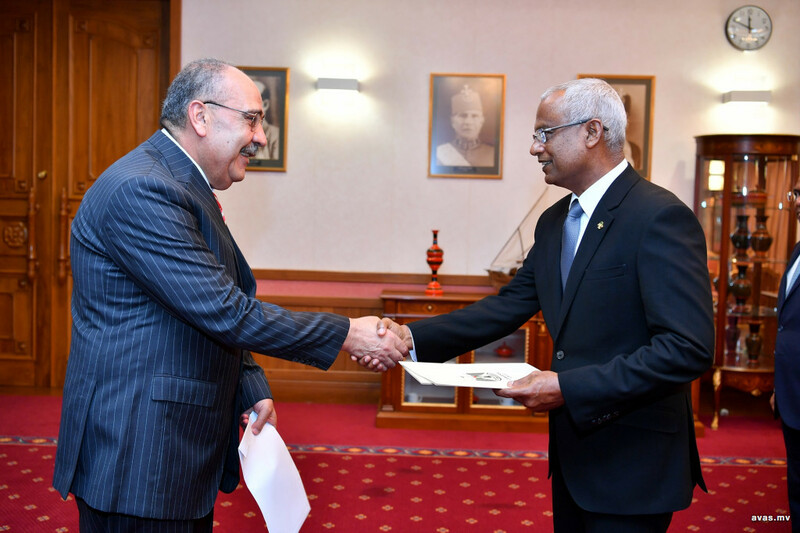 The President made the statement at the ceremony held on Sunday where Ambassador of Palestine to the Maldives, Mr. Walid A.M. Abu Ali presented his credentials to President Solih. During the ceremony, the President and the ambassador held a brief discussion on bilateral ties between both countries. The President noted that Palestine holds a special place the the hearts of the Maldivian people, and affirmed the country's support in Palestine's efforts towards international recognition of their statehood. Ambassador Mr. Walid A.M. Abu Ali expressed his pleasure in being able to represent the people of Palestine in the Maldives, and pledged the country's support in building and maintaining the relationship between both countries The ambassador further acknowledged that the Maldives has always been supportive towards Palestine, and thanked the people of the Maldives for their support.